Wat Phan Tao is another temple that we found whilst on our temple trail in Chiang Mai. 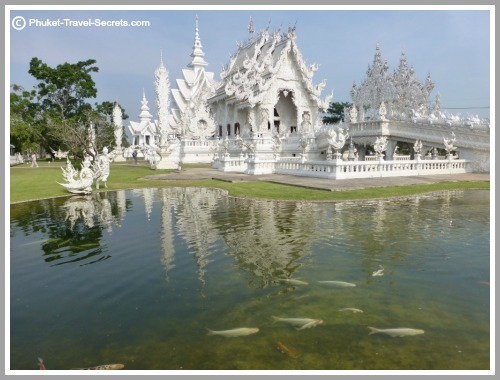 We found this temple to be quite interesting and slightly different from other temples that we visited on our travels around Chiang Mai. 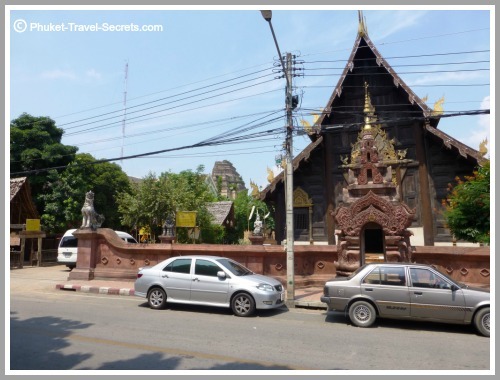 The difference with Wat Pan Tao is quite evident; the viharn is constructed from unpainted teak, which is unlike most of the golden temples that you see throughout Thailand. 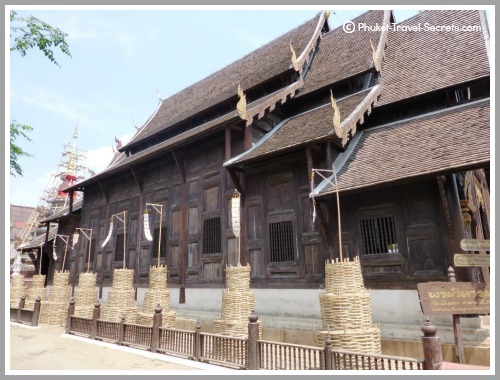 The viharn which is in the picture above was built in 1846 and was originally a throne hall for the ruler of Chiang Mai. 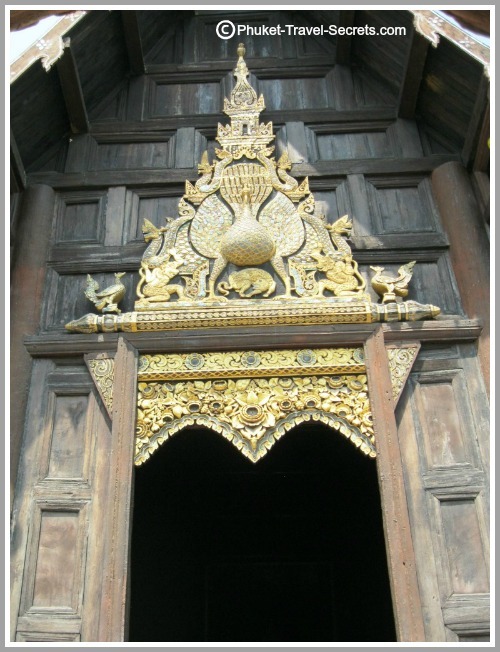 The wooden panels of this temple are beautifully carved; one of the most striking features of this temple is the large gilded wood carving of a peacock that is positioned just above the main door. 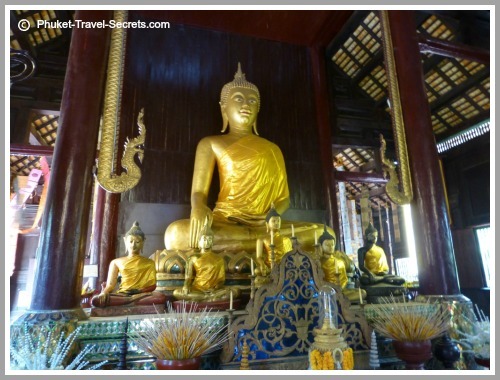 Once you step inside this small but impressive temple, you will see teak pillars which frame a large golden Buddha statue that sits at the far end of the viharn. 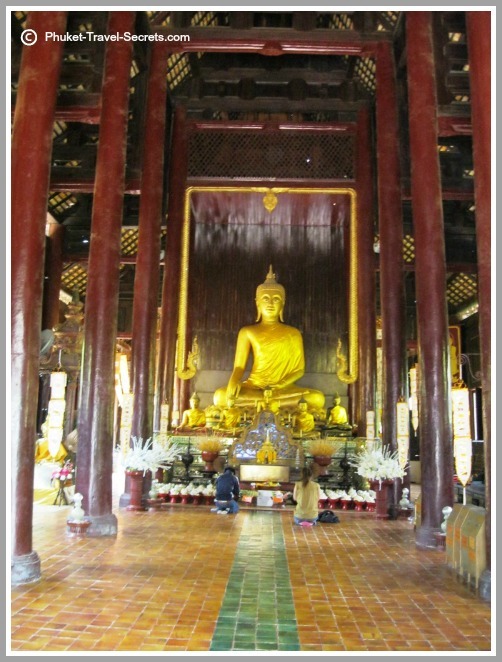 The large Buddha image is surrounded by smaller seated Buddha images. 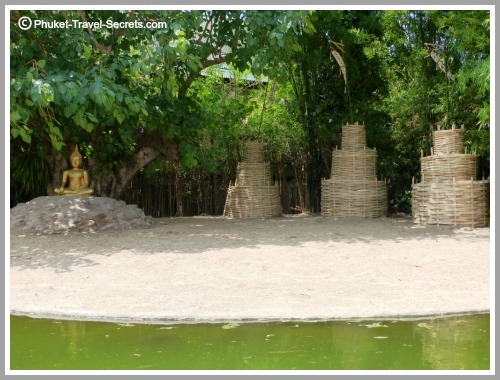 Also found on the temple grounds is a large Chedi, the monks living quarters, and a quaint little garden and fishpond. 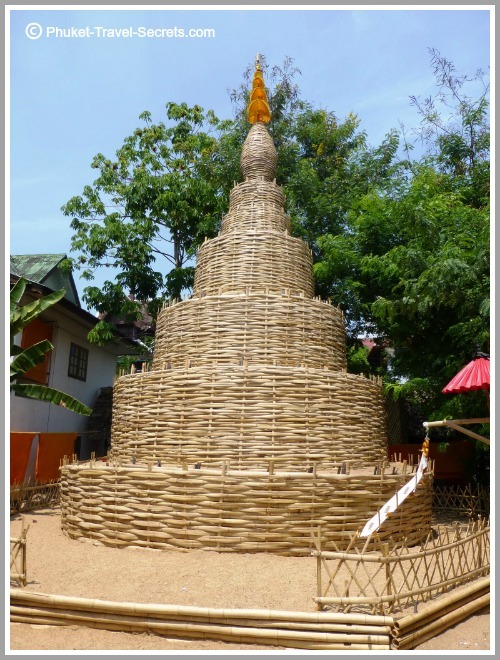 Wat Phan Tao is one of the older temples in Chiang Mai; and is one of a few remaining wooden temples in Thailand. 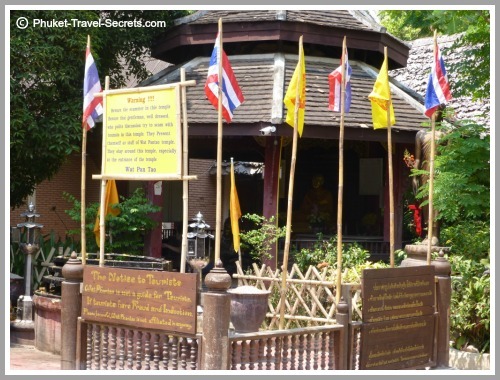 Unfortunately Wat Phantao is often overlooked by many visitors. 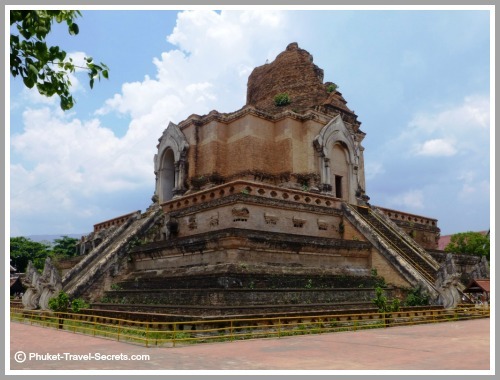 The main reason for this could be because of the close proximity to the very popular and more well-known Wat Chedi Luang, that is in the background of the picture above. Or maybe it’s because of all the warning signs that are erected on the grounds of the temple to warn tourists to beware of scammers in the temple. 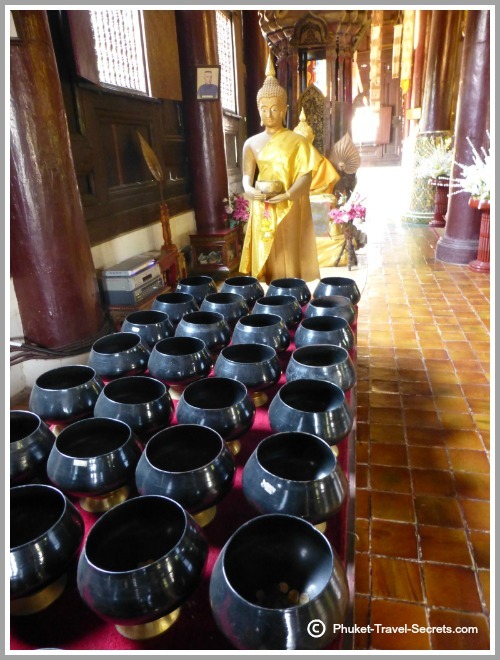 We didn’t have any problems or come across any scammers when we visited Wat Phantao. However, if you do visit the temple just beware not to buy any souvenirs or tour services from anyone around the temple area. 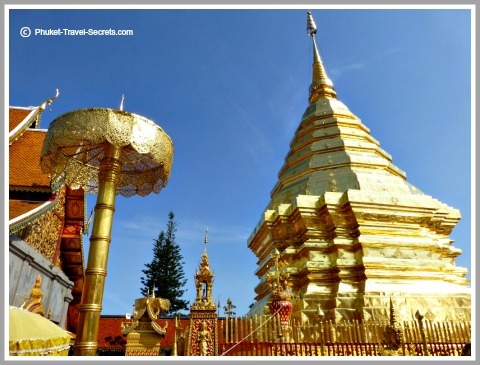 Wat Phantao is located in Phrapokklao Road next to Wat Chedi Luang in the heart of the old city walls of Chiang Mai.